Exceptional contour definition combined with high print density. XtremeEngraving is an engraving process to achieve exceptional contour definition combined with high print density. XtremeEngraving separates write resolution from the selected screen. In principle, the HelioKlischograph works like a laser imagesetter. This means that ultrafine resolutions can be combined with high ink application volumes. XtremeEngraving is used with great success to reproduce logos, bar codes, labels, drug packaging, micro lettering, security features, and cigarette packaging. With a write resolution of up to 540 l/cm, XtremeEngraving achieves results that in their detail are every match for laser engraving. 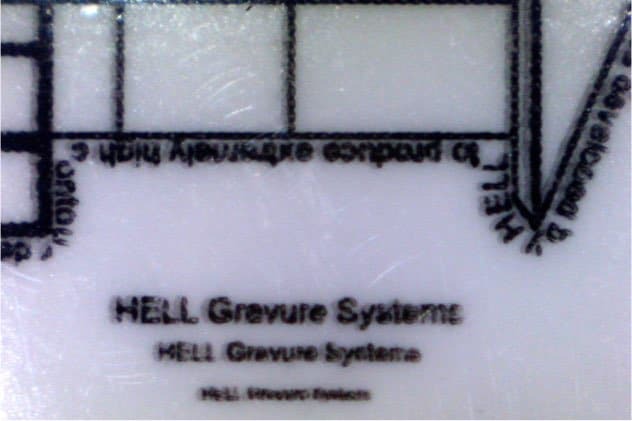 Yet XtremeEngraving also supports coarse screens with cross diagonals of over 1000 μm and engraving depths of up to 100 μm.